It is great to be here! 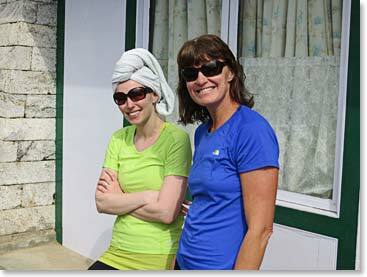 We have fantastic stories and photos from our first two days of trekking. Wednesday was a long day of trekking from Lukla to the village of Monjo. Today we entered Sagarmatha National Park, climbed the infamous Namche Hill, and arrived at Panorama Lodge, at 11,400ft/3,475m by 1:00 PM. The report from five of our Sherpas at Base Camp is that the progress with the construction of our tent platforms is going well. 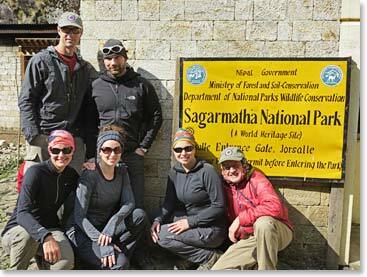 But now is time for a great trek with our trekking team. We are all trekkers now. 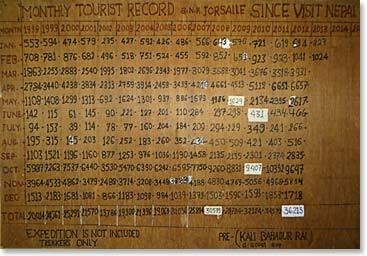 For years it has been interesting to view the updated stats board at the park entrance, which goes back to 1998, logging the numbers of trekkers who enter the park month by month. Expedition climbers are not counted. 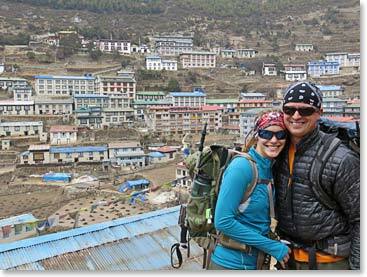 We will send a more detailed account of our trek thus far tomorrow, dinner is about to be served but for now, here are a few images to show why we love Namche. Early this morning we entered Sagarmartha National Park. A few of us stopped for a picture op at the Park entrance. 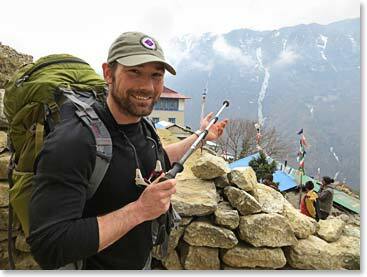 In Namche, Steve eyed an ice climb. Everest is ahead of us, but we are awed by everything around us for now. What a place! Why we love Panorama Lodge, Part 1. Katie Ross and Joanne were showered with clean hair shorty after we arrived. Why we love Panorama Lodge, Part 2. Time for yoga. 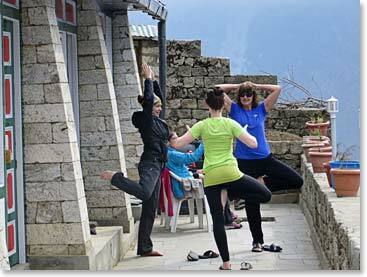 Why we love Panorama Lodge, Part 3. 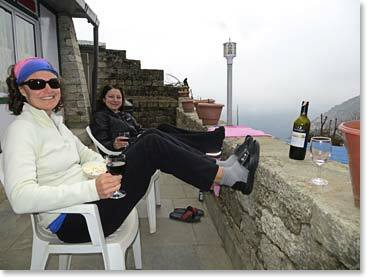 Right after yoga, Joanne and Katie Braham relaxed with a bottle of wine outside their room.